LaCie announced the Rugged Mini, a new line of rugged portable hard disk drives with USB 3.0 support. 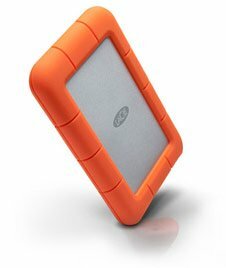 Today LaCie announced the latest addition to its family of award-winning Rugged hard drives — LaCie Rugged Mini, design by Neil Poulton. Based on the Rugged's shock- and drop- resistant features, the Rugged Mini is 40 percent smaller, rain-resistant and can withstand one ton of pressure. Coupled with its scratch-resistant aluminum casing and LaCie Private-Public software, the Rugged Mini is sure to keep your data safe and secure. With its small size, as well as shock-, rain- and pressure-resistant capabilities, the Rugged Mini is ideal for anyone on the go. Professionals and students alike can easily transport the drive in their bag for school or for an outdoor photo shoot, and be confident their files are safe and secure. Video professionals will especially appreciate the Rugged Mini's speed with USB 3.0 and 7200 RPM model for onsite file transfer. Additionally, the Rugged Mini is backward compatible with USB 2.0. This means it will work with any computer or notebook that has a USB connection — offering instant usability, no matter what version of USB you have. The Rugged Mini is completely bus powered and features the USB 3.0 interface — which helps it perform three times faster than USB 2.0. This hard drive can transfer one HD movie in less than three minutes, 1000 MP3 music files in 42 seconds or 2,000 photos in about one minute. The included software suite is fully compatible with Mac® and PC computers. It allows users to easily set up the hard drive, as well as back up and secure data. You can even enable the eco mode for power savings. The Rugged Mini offers LaCie's Private-Public software with AES data encryption and password protection — ensuring your files are always secure. For further backup and security, the Rugged Mini includes 10GB of Wuala secure online storage for one year, allowing you to securely store, share and sync your data online. The Rugged Mini will be available soon in 500 GB or 1TB capacities through the LaCie Online Store, LaCie Corner, and LaCie Reseller+ starting at the suggested retail price of $95.00 (VAT included).